The Board of Directors of Sompo International Holdings Ltd. (the Company), a wholly-owned subsidiary of Sompo Holdings, Inc. and the successor to Endurance Specialty Holdings Ltd., sets high standards for our employees, officers and directors. Implicit in this philosophy is the importance of sound corporate governance. It is the duty of the Board of Directors to serve as a prudent fiduciary for shareholders and to oversee the management of the Company’s business. Sompo International has established several methods to facilitate the communication of ethical concerns about the Company by employees, clients, vendors and other interested parties. Such communications may be reported by accessing MySafeWorkplace, a third party, anonymous and confidential incident reporting system. Board of Directors, Sompo International Holdings Ltd.
John R. CharmanExecutive Chairman of the Board of Directors, Sompo International Holdings Ltd. and Chief Executive Officer of Overseas Insurance Business, Sompo Holdings, Inc.
Nigel FruddExecutive Director & Chief Executive Officer, Sompo International Holdings Ltd. and Senior Executive Vice President and Chairman of Overseas M&A, Sompo Holdings, Inc.
Mikio OkumuraNon-Executive Director, Sompo International Holdings Ltd. and Group Chief Strategy Officer, Sompo Holdings, Inc.
Chris Gallagher was promoted to Chief Executive Officer of Sompo International Commercial P&C in April 2019 and retains the role of Chief Risk Officer and Group Actuary of Sompo International Commercial P&C, a role which he assumed when he joined the company in September 2015. Mr. Gallagher was named a member of the Sompo International Holdings Ltd. Board of Directors in February 2019. Prior to joining the company Mr. Gallagher held a global Chief Risk Officer role at a leading property and casualty carrier after serving as a consultant providing insurance and actuarial advisory services in the London market. Mr. Gallagher holds a Bachelor of Science degree in Mathematics and Statistics from the University of Glasgow and is a Fellow of the Institute and Faculty of Actuaries in the UK. 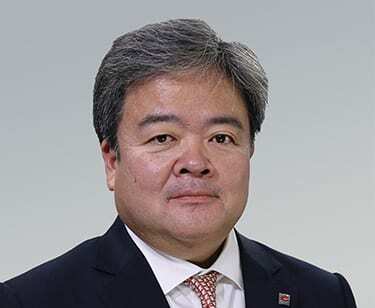 Non-Executive Director, Sompo International Holdings Ltd. and Group Chief Strategy Officer, Sompo Holdings, Inc.
Mikio Okumura was appointed an Executive Director of Sompo International Holdings Ltd. in March 2019. An Executive Officer of Sompo Holdings, Inc. since April 2015 and Director since June 2016, he was appointed Group Chief Strategy Officer in April 2019. Previously, he served as business owner of Nursing Care & Healthcare at Sompo Holdings, Inc. since April 2017 and Chairman and Executive Officer of Sompo Care Inc. Mr. Okumura joined the company in Brazil in 1989 and, throughout his thirty year tenure with Sompo, has held leadership roles within investment banking, the overseas insurance business, and corporate planning.